Nope. That wasn’t a typo. Just being cute. You are bound to find caprese salad recipes all over the place. 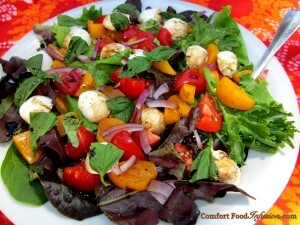 It is a very popular salad using fresh tomatoes, mozzarella, and usually basil, balsamic vinegar and olive oil. The time of year could have a little to do with it’s trend. After all, many of you are probably harvesting tons of garden tomatoes, or being given them by family, friends, neighbors, strangers, etc. Of course, I am craving this salad, as well as… salad. It seemed like such a perfect idea, to place this delicious ‘salad’ on top of a plate of lettuce, though I’m quite sure I was not the first to think of doing it. I can not tell you how much I loved this. I hastily snapped my picture for this post, and I promise you, the plate was empty and licked clean four minutes later. Gotta go, I’m going to make myself another one. Fresh mozzarella, tomatoes, basil and onion sit atop baby lettuce, and dressed with reduced balsamic glaze. In a small sauce pan, combine balsamic vinegar, honey, and garlic cloves. Bring to a boil, then reduce heat to a simmer. Simmer, uncovered for about 20-30 minutes so the balsamic will reduce and become thicker. At this point the vinegar should have reduced to about half a cup (mine was just over half a cup). Remove from heat to cool, and discard garlic pieces. (You may not need all of this for the dressing. You can store in the refrigerator for later use). Chop tomatoes, slice onions, and slice mozzarella balls in half. In a large serving bowl, pour bagged lettuce. Top lettuce with tomato, mozzarella and onion. Tear basil leaves into small pieces and scatter over salad. Season with salt and pepper. Drizzle with cooled balsamic vinegar reduction (I used about 1/4 cup of the mixture), and olive oil. *You can substitute large tomatoes with about 1 pint cherry tomatoes. *You can use any type/size of fresh mozzarella, simply slice into bite size pieces.